Buzz-word technologies such as “mobile” and “cloud” have featured heavily on warehousing trend lists for years. Today, these trends are a reality where the digital supply chain is making logistics faster, more efficient and cheaper. According to Warehouse Management System expert Jim Laverty, integrated companies will have the most growth. eCommerce has revolutionised the way we shop with online shopping accounting for 8.7% of total retail spend worldwide. As eCommerce continues to rise, retailers are employing hundreds and thousands of temporary workers to pack and ship orders over busy holiday periods. 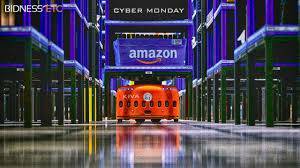 In a bid to automate the picking process, Amazon has invested in its own robotics division, where robots perform real-world tasks such as picking orders and restocking shelves. In 2016 robots were picking at a speed of 100 items per hour, a significant improvement from the 2015 record of 30 items per hour. While it may be a few years until robots match the accuracy and speed of humans, robots are most likely going to be involved in the picking process in the future. 2016 was the year of the Pokémon Go phenomenon, where the AR game exceeded 500 million downloads worldwide. Augmented Reality is not just for gaming, but is a technology that is rapidly becoming important in business, bridging the gap between the digital and physical world. AR can be beneficial to any worker who needs hands-free access to contextual information which opens up the potential use cases immensely in Logistics. Benefits include higher efficiency, reduced training, and greater productivity. 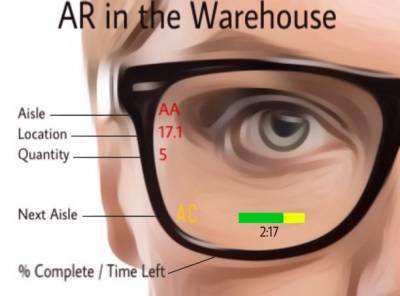 Last year DHL piloted AR in Europe and the United States, where warehouse pickers were equipped with advanced smart glasses which visually displayed where each picked item needed to be placed on the trolley. Vision Picking enabled hands free order picking at a faster pace, and reduced error rates. While technical challenges such as performance, battery life and weight are factors to consider at present time, these barriers are expected to be broken down within the next few years. With Cerasis reporting that augmented reality technologies are growing at a rate of 100% annually with an estimated $600 billion dollar value, expect to see some amazing developments in this area. While the cloud was once believed by many to be unsecure, the benefits of cloud can longer be overlooked. Today, the supply chain industry has increasingly turned to cloud-based applications like a warehouse management system (WMS), where it is predicted that three quarters of all warehouse management system users will be in the cloud by 2020. In 2017, having an entirely reliable supply chain with near perfect uptime is now an expectation. Organizations no longer tolerate data security risks which may cause downtime. As cloud is now the safest place for your data , it’s predicted that more organisations will adopt cloud-first and cloud-only policies in place of on premise systems. According to the Global Climate Catastrophe Report, the world is seeing an annual average of 260 major natural disasters with an approximate annual economic loss of $211 billion. Real-time location tracking and comprehensive field analytics are helping to minimise the disruptions caused by natural disasters. By integrating mobile sensor data with predictive analytics, organisations will be able to react quickly to changing conditions in real time. Overall, 2017 will be an exciting year for innovative ideas and developments in warehousing, manufacturing and IT. What topics do you think will define this year?